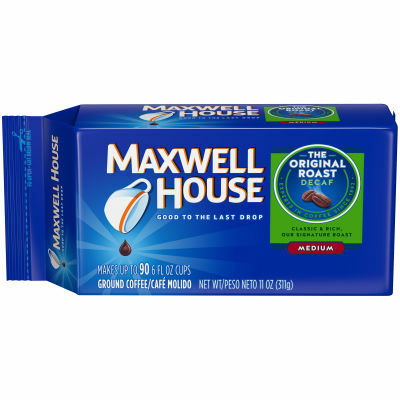 Maxwell House Decaf Original Ground Roast Coffee - Get your day off to a good start with a cup of Maxwell House Original Ground Roast Coffee. This robust blend offers a classic taste that will wake you up and keep you going. Savor the moment and indulge in its aroma and luscious taste. - Decaffeinated and Alluring, It's Our Signature Blend - Perfect decaf coffee is no coincidence. We make our Maxwell House Decaf Original Ground Roast Coffee from our rich, classic signature blend of naturally decaffeinated coffees. If you wish to limit your caffeine intake, this ground roast is the way to go.